Bulgaria: Will the right-wing government succeed in crushing the disabled? About 6,000 people with disabilities and citizens supportive of their demands have protested in front of the Council of Ministers in Sofia. They opposed the government’s ideas for the next “reforms”, which are expressed in cutting funds and setting groups of poor people against each another. 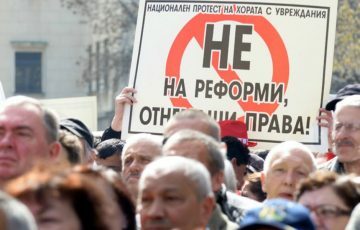 A protest under the slogan “No Rights-Removing Reforms” united thousands of people with disabilities and other supporters of their demands on Independence Square in the capital of Bulgaria. According to the organizers, about 6,000 people gathered under the windows of the Council of Ministers. Behind the protest are 18 organizations for people with disabilities, and the event was officially supported by KT “Podkrepa”, the Bulgarian Solidarity Association, the Autonomous Workers’ Union and others. “Reform – yes, but not like this,” was another of the main slogans during the protest. People with disabilities are adamant that the system really needs changes, but definitely not the ones that the government of Boyko Borissov is suggesting. A day before the rally under the windows of the government, the organizers gave a press conference announcing their main demands and the reasons for the protest. The most urgent ones were two formal concepts – medical expertise and workability. The first, which had already been prepared, was quickly withdrawn, in a style typical of Prime Minister Boyko Borisov. This crisis decision did not persuade the disabled to give up their protest, and they filled the “triangle of power”. The organizers submitted their letter of protest to the Cabinet of Ministers, the National Assembly and the Presidency, in which they expressed their main concerns and offered solutions to the problems, but through dialogue, taking into account their interests and expertise. “We want our words to be heard, to hear what our children, our loved ones, our families need. Apart from listening, we must be heard. We must make such reforms that our lives become more decent, better and more fulfilled,” said Adriana Stoimenova, Executive Director of the Center for Psychological Research. More than 4,000 people came to Sofia from different parts of the country to say “No!” to the reforms that once again in Bulgaria are expressed only in the cutting of funds – and whose political effect is to set one group of poor and disadvantaged people against another. The main proponent of the reform, which forced people with wheelchairs, escorts and white canes to walk the yellow paving stones of Sofia, is the far-right Deputy Prime Minister Valeri Simeonov. A special guest of the protest was Rudolf Katani, a member of the Board of the European Disability Forum and chair of the European Union Relations Commission with the European Union of the Blind. “Eighty million people with disabilities at this time are with you and support you,” he told the gathered crowd from the rostrum. Katani urged the government in Bulgaria to abandon this reform and start talks with organizations of people with disabilities. Then he repeated several times in Bulgarian the word “Shame!”, which he considers the best word to describe the planned changes. “The state wants to take away the disability pension by saying that people with disabilities have to work and at the same time it does not provide job opportunities, accessible architectural environments or transport,” he added, criticizing the Cabinet for failing to recognize the UN Convention on the Rights of Persons with Disabilities, which Bulgaria ratified in 2012. “We don’t want handouts – we want rights”, Katani finished. “Integration – YES, discrimination – NO!”, “We want jobs” and “Europe for us too” were among the most common posters. “Do you know what it is like not to see the light? Do you know what it is like not to hear the river? You know what it’s like not being able to tell your child “I love you”? Do you know what it is like to not be able to leave home without aids? Do you know the feeling when your life depends on pills and injections every second? Or you cannot walk in the street because you are one metre lower and people do not see you? Do you realize what it cost all these thousands of people to come here?”, the president of Labour Confederation”Podkrepa”, Dimitar Manolov, asked the government. Strangled by worry and fear, these people have nevertheless come to tell the ruling elite that what they are doing is nonsense, Manolov insisted, adding that “these people don’t have black SUVs with disability stickers which they bought – these are people who are really suffering”. “This reform should have begun with those who unfairly use the resources which are there for people who need them. But no – the first thing that was done was to attack the people who really needed these rights. It’s not a reform – it’s a nasty mockery”, added Manolov. From the statement of Bulgarian Solidarity: “another picking of the torn pockets is happening – these are the pockets of the most defenceless – the blind, the deaf, those without limbs, the cancer patients”. Another attempt to confront one group of disadvantaged and poor people with another on the pretext that frauds are being fought, insists the Association. Full support for the struggle and demands of people with disabilities was showed by Mirena Filipova on behalf of Bulgarian Solidarity during the protest. 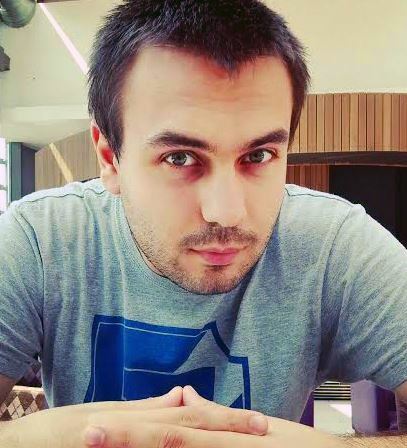 Draganov is a Bulgarian journalist based in Sofia, currently writing for the left analytical platform BARICADA He graduated at the University of National and World Economy in Sofia has earned a BA degree in sociology and an MA in marketing. Since 2012, he has been working as a political journalist for various Bulgarian news outlets i.a. News.bg, BGNES and BiTelevision. As a parliamentary reporter he covered the work of the 42nd and 43rd National Assembly. Co-author of the documentary movie “The Invisible People”.